Under the dim lights of the Chapel at King’s College London, Senscapes crafted a 30-minute audio-visual immersive experience that guided the audience through the phenomenology of a psilocybin trip. Psilocybin, the psychoactive compound that occurs naturally in magic mushrooms, has the capacity to alter consciousness in a profound way. In Harmonics of Mind: Exploring Psychedelia, Senscapes have attempted to bridge the gap between the subjective feelings experienced during a trip and the objective mechanics studied by neuroscience, by using magnetoencephalography (MEG) recordings of brain activity from a volunteer undergoing a psilocybin experience to produce an expansive installation of sound and art that attempted to convey the sensations of the trip. The audience sat on the chapel floor, surrounded by hair-raising music that took us through the build-up as the participant entered the psychedelic state, followed by the height of the psychedelic experience, and lastly the ‘afterglow’, a warm and calming selection of sounds that slowly brought us back to reality. The visuals created through cymatics, a term used to describe the vibration of sound frequencies, were presented on large screens that completely surrounded the audience and contributed to the immersive feeling. The performance was used as a catalyst for a panel discussion chaired by Senscapes’ Managing Director (Joe Barnby) and included neuroscientists from the Psychedelic Research Group at Imperial College London (Dr David Erritzoe and Chris Timmerman) and University of Oxford (Dr Selen Atasoy), a clinical psychologist (Dr Rosalind Watts) and a participant in the psilocybin study (Ian Roullier). The panel discussed recent evidence suggesting that the broadening of consciousness and ego dissolution reported as part of the subjective experience of a psychedelic trip may be accounted for by observable changes in brain dynamics. The brain on psychedelics becomes more unpredictable and creative, which Dr Selen Atasoy compared to ‘an improvising jazz musician’, and this has been linked to changes in the default mode network and reduced alpha rhythms in the brain. A highlight of the panel discussion was hearing Ian Roullier talk about his personal experience of taking part in the recent Imperial College London clinical trial using psilocybin for treatment-resistant depression. Ian described his experience in vivid detail and talked about how the ambient music and the psilocybin interacted and guided him on a journey in which he revisited past experiences and ‘learned that sadness is just as valid as happiness’. Results from this study in which Ian and 18 other participants were involved were published in Scientific Reports and describe long-lasting benefits that may be related to the ‘resetting’ of key brain circuits involved in depression. 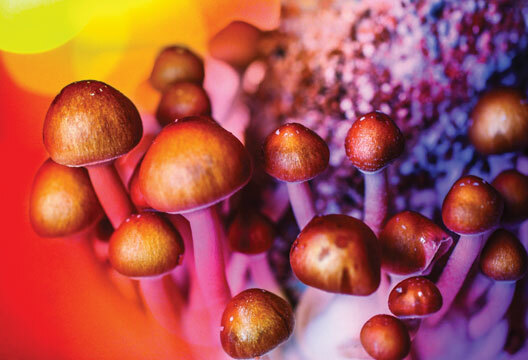 Investigating the therapeutic benefits of psychedelics was put on hold in the 1970s, when the US classified these substances as Schedule 1 and imposed strict prohibitions on their use in research studies. In the last few years, however, renewed interest in psychedelic research has led to promising results in studies of the treatment of depression, anxiety and PTSD, led by research groups such as the one at Imperial. Understanding the complexity and subjectivity of a psychedelic trip above and beyond the information provided by scientific data is made possible by new initiatives such as Senscapes, which manage to creatively bridge the boundaries between scientific knowledge and human experience.